Kenya, unlike xenophobic South Africa, has been known to be very welcoming to foreigners. We are so welcoming that even at the height of post election violence, we still preferred welcoming them to living with the neighbors we had lived with since we were born. Clones are the computers which are mostly unbranded and assembled by small scale assemblers in Kenya or the east. Also note that alsthough the casing might bear brands such as Digitek, mpaq, xcess or the like, mostly printed, this are also clones since thoise are just manufacturers of the case. The components inside the case will be from different manufacturers in most cases. common components include motherboards from mercury and via processors. By my observation, the largest source of e-waste is CRT monitors, which are shipped and sold cheaply here. typical prices are between 2000 and 4000 kshs compared to ksh. 12,000 for a decent e nvironment friendly TFT-LCD. 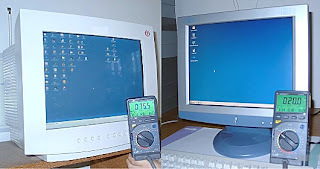 The above image shows a CRT(Cathode Ray Tube) on the left vs a TFT-LCD (Thin Film Transistor Liquid Crystal Display ) and their power consumptions. A TFT-LCD consumes upto 70% less power than a CRT. Most of the computers that we buy at very cheap prices, and most of those computers that were donated to your neighbouring school arent waht they seem to be. Matter of fact, this are elecronic rejects from Europe, USA , Australia and Singapore. Infact, some of them usually have company brandings and logos from their countrys of origins. This countries have implemented stringent laws to curb on disposal and dumping of such wastes. infact, you have to pay for disposal of such wastes, or "donate" them to Kwa Nzili primary school somehere in Kitui(is this in china) where they will go a long way towards helping poor students attain important IT education.You may also pay for disposal of the waste, and then the waste will be imported by some shady business mane, who will be making ICT affordable to all by selling you a pentium II unit at Ksh. 4000 complete. Bargain, well not, a pentioun II will run windows XP with difficulty, and little or no other current programs on top. it will be just a toy fro your kid to play with his pirated copy of Need For Speed II SE on top of a pirated copy of Windows 98 several times. This waste will continue stock piling in our country as we sit back and enjoy the low prices and donations for the moment.What happens when we realize we do not need this stuff, or it breaks down, as they always do, since it was refurbished. We will burn it, releasing heavy metal such as lead, mercury, cadmium or bromine into the environment.We also lack any guidelines here for dealing with such wastes, leave alone any processing plants. Meanwhile, the people in charge of e-waste disposal in the developed world are laughing all the way to the bank as they are paid to dispose off waste which they "donate" or resell to you. The goverment shoul come up with a department to control this problem, and a measure taxing old electronic parts would also go a long way. For example, I think that CRT monitors hsould be taxed to price them at par with TFT monitors. what do you think of this blog. you can e mail me at gramware@gmail.com or my other e-mail addreses to voice your opinions.